The Society for Italian Studies supports research across the discipline by holding three conferences: the Biennial Conference; the Themed Conference (previously known as the Interim), and the Postgraduate Colloquium. The Society also supports research by providing some funding to conferences and symposia run by SIS members. The Society holds a residential conference every two years. 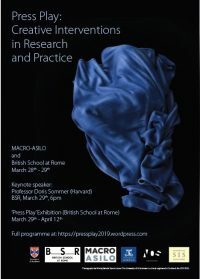 The 2019 Biennial Conference for the Society for Italian Studies will be held atthe University of Edinburgh from 26th-28th June. We strongly encourage diversity of panels, to represent a broad range of interests and activities in any field of Italian Studies. Panels typically consist of 3 papers of no more than 20 minutes (+ 10 minutes for discussion) – each panel session should not exceed 90 minutes. Within the possibilities of the programme, proposals for consecutive panels are also welcome. Panel proposals may be written in English or Italian. The deadline for submissions is Monday 19th November 2018. Please submit your Panel Proposal using the online form in our conference website – http://edin.ac/sis2019. For further information, please email: sis2019edinburgh@ed.ac.uk. The Society holds a smaller, themed conference on alternate years to the Biennial Conference. The 2018 SIS Themed Conference was held from 5th to 6th April, 2018 at the University of Sussex. The theme for the 2018 Conference was Resistance in Italian culture: Literature, Politics and Film. The Conference was organized by Dr Ambra Moroncini (University of Sussex), Dr Darrow Schecter (University of Sussex) and Prof Fabio Vighi (University of Cardiff). The programme and the Conference Report are available. The Society holds an annual Postgraduate Colloquium. See this page for further details. The form for the registering of interest in holding the Biennial Conference is available below. Please complete the form as fully as possible, bearing in mind that not all questions will be relevant to the Biennial Conference (the form covers both this and the Themed Conference) and return to Gigliola Sulis, as Hon. Secretary at g.sulis@leeds.ac.uk. The 2017 Conference was hosted by the University of Hull from 27th– 30th June 2017. The programme is available for dowload is available to download in PDF format. The 2015 Conference was hosted by the University of Oxford from 28 to 30 September 2015. The programme is available for download in PDF format. The 2013 Conference was hosted by Durham University from 8 to 11 July 2013. The programme is available for download in PDF format. The 2011 Conference was hosted by St Andrews University from 6 to 9 July 2011. The programme is available for download in PDF format. The 2009 Conference was hosted by Royal Holloway University of London, from 16 to 19 April. The 2014 Themed Conference, Interstitial Italy: Reassessing Global Questions Through the ‘Peculiar’ Italian Case, was held at the British School at Rome, 27 and 28 March 2014. The programme is available for download in PDF format. The 2012 Themed Conference, Transnational Italy: National Identity and the World Atlas, was held at the University of Reading’, 13 and 14 July 2012. The programme and abstracts are available for download in PDF format. The 2010 Themed Conference, Religion, Mysticism and Heresy in Italian Culture, was held at the Palazzo Pesaro Papafava, Venice, 16-17 April 2010. The programme is available for download in PDF format. The 2008 Themed Conference, Transmissions and Transformations of Italian Culture, took place at the Institute for Germanic and Romance Studies, University of London, on 25-26 April 2008. The programme and abstracts are available for download in PDF format.